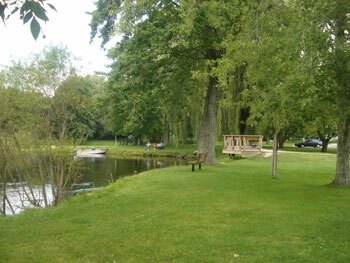 Set along the Pere Marquette River is the picturesque Scottville Riverside Park. Once just swampland, it is now a beautifully landscaped area on approximately 30 acres within the Scottville city limits. Not all the park is developed, allowing for future expansion. Scottville Riverside Park offers over 50 modern sites, complete with electricity, water, and cable. Primitive sites are also available, for those who care to "rough it" a bit. There's a handicap accessible bath house and laundry facilities, along with a large shelter with stone fireplace. North of the trailer site is a camping area with its own shelter, used by scouts and young people on canoe trips. See campground listings for more camping options in the Scottville area. Near the entrance is the picnic area, complete with numerous tables, grills, kindling wood, and playground. 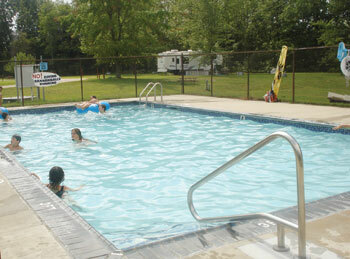 Activities at Scottville Riverside Park include basketball, volleyball, shuffleboard, horseshoes, and an outdoor pool. An off-site boat launch allows those with kayaks and canoes to head out onto the Pere Marquette River, which is also known for its quality trout and salmon fishing. Since many of the original trees died when Scottville Riverside Park was being built, a new project was formed to plant new "memorial" trees. If anyone wishes to have a tree planted in memory of a loved one, they can do so, and just pay for the annual cost of the tree. A plaque in the park shelter has the names of people that are already "memorialized." Whether you have a weekend or a month, Scottville Riverside Park is a safe, friendly, and quiet place to spend time with family and friends, located just ten minutes from Ludington and Lake Michigan.